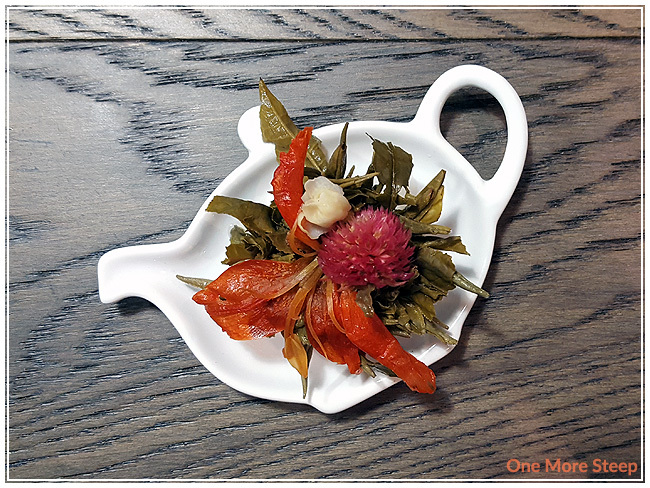 Blooming teas, or flowering teas, are bundled tea leaves around dried flowers. 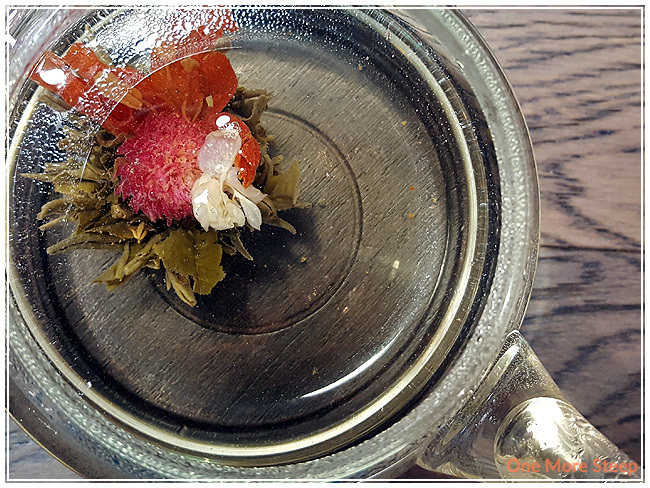 Typically when you pick up a blooming tea ball, you only see the tea leaves because the flowers are meant to be a surprise. During the steeping process, the ball opens up, unfurls, and the dried flower ‘blooms’ as it is hydrated in the steeping process. Commonly found flowers in blooming teas include globe amaranth, chrysanthemum, and jasmine flowers. Blooming teas are typically made with white or green teas, as these teas are light in colour and allow you to visualize the floral blooms better. You will want to steep a blooming tea in either a clear glass teapot or cup in order to take in the whole ‘show’, as I like to call it. 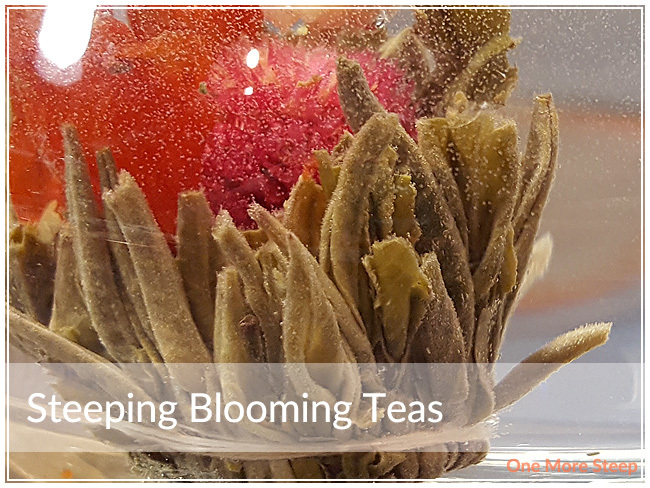 Some people find that it’s difficult to steep blooming teas properly, or they wind up oversteeping blooming teas because the teas can be delicate and sensitive to oversteeping. I thought I’d share some of my methods of steeping a blooming tea to make a good cup of tea! Blooming teas can be expensive per pot, so it’s important to steep it properly to make it worth it! I use a clear glass teapot, I find this best to see the blooms and to watch the ball of tea itself as it steeps. It just makes for a more beautiful tea experience. The kettle I use has preset temperature settings (the Breville IQ Kettle, I’ve had it for 2+ years and it’s still going strong with daily use!) and I use the lowest temperature setting which is meant for green teas, 175°F (80°C). After the kettle has finished reaching the temperature, I let the water sit for about 5 minutes prior to pouring the water into my teapot. If you have a standard kettle that only boils (100°C/212°F) water, you’ll want to let the water sit for longer to cool down – open the lid or taking off the lid will help the water cool down faster. Lowering the temperature of the water reduces the likelihood of scalding or burning the tea leaves and causing a bitter flavour. Some companies will provide steeping recommendations, but I find sometimes that their recommended water temperature is too high given the fact that there’s a longer steeping period for the blooming tea to fully open. Each blooming tea will steep for a different amount of time, I consider it to be ready when the ball has opened up and the flowers have ‘bloomed’ as well – some blooming teas will have the flowers floating up to the surface. Often the process of blooming can take up to 5 minutes or more. I find that blooming teas with a white tea base are far more forgiving and less likely to result in a bitter cup of tea than one with green tea base. Blooming teas can also be resteeped! Because the flavours come from the tea leaves and blossoms, there’s generally no added flavouring and the tea leaves can be resteeped usually once or twice. The flavouring may be a bit weaker than the initial steep, but you can get more bang for your buck by resteeping the tea leaves.